Hyram Smith’s book 10 Natural Laws of Successful Time and Life Management has an excellent section on productivity and beliefs. He views beliefs as a window through which we see the world. This view can be reasonable or distorted, depending on the belief system. Working from Needs on the left-hand side, we make assessments of how well our needs are being met based on our experiences. This leads to a vision of where we want to move our lives to. When we see gaps between the results of our actions and this vision, we plan how to close these gaps and set goals. We then take action, leading to results which complete the upper feedback loop. Note that the both the external environment and our habits influence our actions and subsequent results. 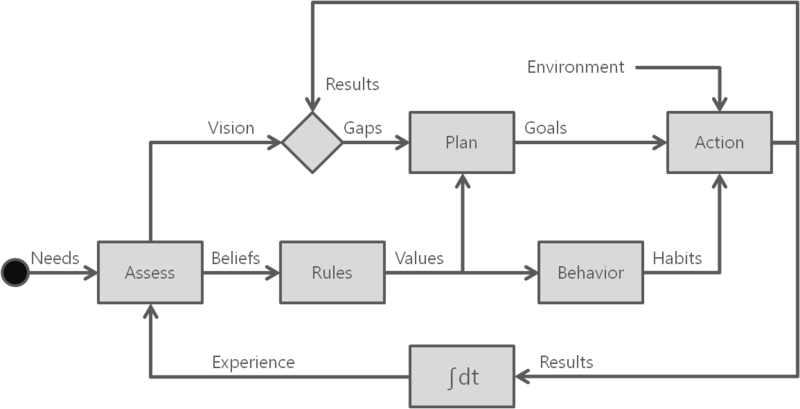 As we accumulate results over time (depicted by the integration symbol), we build experiences. As we assess our experiences against our needs, we also build beliefs. These beliefs become operating rules that establish our values. These values are reflected in the plans we make (for example, those that value honesty don’t make plans that rely on deception). Our values are also reflected in our behavior, which gets translated into habits (behavioral shortcut responses to situations). As Hyram Smith points out, the time lag between results and our assessment of experience often makes it difficult understand the impact of our beliefs. The key block in the above diagram for getting results is Action. Without action, nothing happens. We can form plans to influence the impact of our environment on action (for example, get a new job). Note that actions are where goals and habits meet. A great many of the choices we make everyday are driven by habits, including procrastination and the inability to make decisions. While we can use willpower for short periods to force actions, this is a limited resource that is quickly overcome and depleted by our habits. So we focus on establishing the right habits to meet our goals, but often fail because we try to use willpower (for example, New Year’s resolutions to exercise more). Without a strong underlying belief to drive what we truly value, it is hard to rewire our habits. As mention earlier, we are willing to take action only if we really believe in something. The other key block in the diagram is Assessment. This is where we create both our vision of where we want to go and our beliefs. The assessment process is the most important part of the feedback model- poor assessments lead to weak vision and limiting beliefs. Without stopping to actively think about this process, many people drift through life without goals or the belief they can’t achieve them.